A THANKSGIVING WINNER AT THE PEARL PUBLIC LIBRARY! It's a happy day for one lucky fella at the Pearl Library! That would be Robert McCarty of Pearl. He entered the Thank Goodness for the Library drawing and won! The prize was a turkey and gift card - $50 total value - donated by the Pearl Wal-Mart. The Library's own Cecelia and Sara share the photo spotlight with Robert and his awesome winnings! 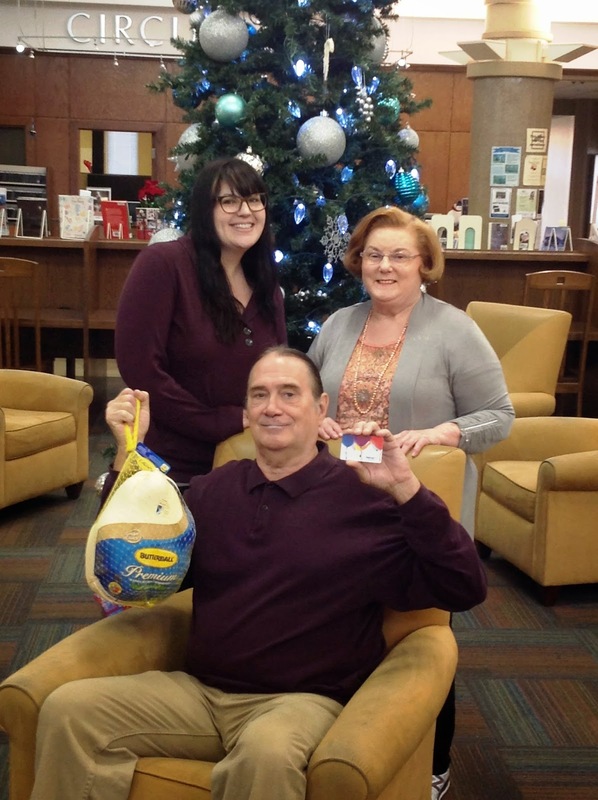 We hope Robert has a wonderfully, happy Thanksgiving, and we are so glad he is thankful for the Pearl Library! The Pearl Library would like to thank Wal-Mart of Pearl for the generous $50 donation! Fines Half Off At Your Local Library! Internet stores report their busiest sales day is the Monday after Thanksgiving, known as Cyber Monday. It is the online version of Black Friday, that Friday after Thanksgiving when we expect big savings on gift items. This year Central Mississippi Regional Library System libraries are participating in Cyber Monday in a very low tech manner. Visit any of the 20 CMRLS library branches in Rankin, Scott, Simpson, or Smith Counties on Monday, December 1, and all fines are 50% off. Yes, half off! "We haven't offered a fine reduction lately," said Mara Polk, director of CMRLS. "School papers and projects will soon be due; we want to especially help these students clear up their fines and to have a successful school year. The offer to cut fines by 50% is open to all ages, for all fines; however this does not apply to collection fees." 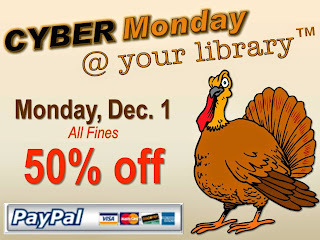 Come in to any CMRLS library during regular hours on Monday, December 1, to take advantage of half off fines. Your local library accepts cash or check. However, it will be possible to pay your fines by credit or debit card. You must visit your library to have staff apply the 50% savings to your account and then use a library computer or your personal device to finish the transaction. To find business hours for any CMRLS library on Monday, December 1, visit http://www.cmrls.lib.ms.us/BRANCHES.htm or call your local library. Happy holidays and good savings to you! YOUR CHOICE MAKES THE CHAPTER 1 BOOK CLUB IN PEARL! The December Chapter 1 Book Club meeting at the Pearl Public Library is Reader's Choice. Uh-huh. Any book your little 'ol heart desires! You read the book and talk about it at the book club meeting. 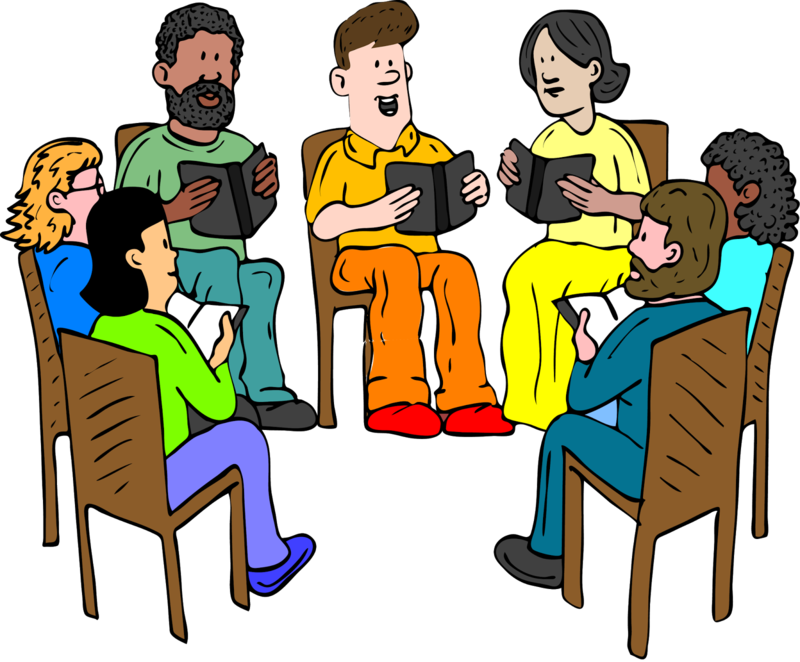 "You come to the meeting and share enough about the book to entice someone else to read it," said Cecelia, the Chapter 1 Book Club's facilitator. You have to admit that sounds pretty fun! Hey! A holiday fiction book would be great. If you need one, the library has plenty. In fact a whole display of holiday reads is up right now! And, more are going up on display soon! Next month's Chapter 1 Book Club meeting is Thurs. Dec. 11 at 6 p.m. You don't need a reservation. You don't have to be a member. You don't even have to commit to becoming a member. Just come on by and join in! Remember, light refreshments and door prizes are always a part of the evening's fun program! BEING THANKFUL HAS ITS REWARDS AT THE PEARL LIBRARY! Thanksgiving and eating go together like turkey and dressing! That's the absolute truth! That's why the month of November brings with it thoughts and the anticipation of that yummy Thanksgiving meal, right?! RIGHT! Well, this year, the month of November also brings a special event at the Pearl Public Library. Tell the library why you are thankful for its services for a chance to win the the grand prize of a frozen turkey from Wal-Mart as well as a Wal-Mart gift certificate - both donated by the Pearl Wal-Mart. That's a total value of $50 for one lucky winner! All you have to do is stop by the reference or circulation desk and fill out an entry, telling why you are thankful for the library. It's that simple. Your entry goes into a grand prize drawing on Mon. Nov. 24. Entries will be taken through, Sat. Nov. 22. Stop on by. We'll see you there!